These reflections discuss many highlights of the year-long City of Clive’s 2006 birthday celebration commemorating 50 years of incorporation. Although Clive has been a community for 125 years, the City of Clive was incorporated in 1956. It was an honor and a privilege to chair the Clive 50th Birthday Planning Committee. I sincerely appreciate the many volunteers, sponsors and other supporters who graciously contributed to a successful Clive 50th Birthday Celebration. Without their wonderful enthusiastic support the birthday celebration events and activities would not have been possible. Mayor Les Aasheim’s superb leadership, commitment and inspirational encouragement contributed to Clive’s successful birthday celebration. The Clive 50th Birthday Planning Committee’s cooperative optimistic attitude and the generous financial donations from many sponsors contributed to a successful birthday celebration. Scott Cirksena was responsible for fund raising for Clive’s 50th Birthday Celebrations. The major sponsors were: Artistic Waste Services, CLIVE REGISTER, DeWaay Capital Management, FASTSIGNS, and Peoples Trust and Savings Bank. I appreciate all of our sponsors wonderful donations and support. I retired in 2002 after 20 years of Program Planner Service with Iowa State Government. In 2003, I became a member of the Clive Historical Society and the Clive Community Enhancement Committee. Many preliminary ideas for Clive’s 50th birthday celebration originated in Clive Community Enhancement Committee Meetings. (4) Promote and show off Clive to others living in other communities. People living outside Clive were invited to come and participate in our many birthday celebration events and activities. Twenty-three people representing many organizations, Clive government, civic groups, schools, churches, and individual citizens were invited to our first Clive 50th Birthday Planning Committee meeting in May 2005. We then meet monthly to develop, refine and carry out our plans for many birthday events and activities. I appreciate Susan Nass taking minutes of these many meetings. In June, we discussed nine proposed slogans, and selected “Clive Five-O” with a tag line “Fifty Never Looked So Good.” Barbara Tetly Anderson, a Clive Freelance Artist, used this slogan and tag line to create her festive birthday celebration logo design that was widely used in our many birthday promotions. Two other proposed slogans “Thrive in Clive” and “Alive in Clive” were not selected. Potential names of what the citizens of Clive could be called. Both of these ideas are discussed later in these reflections. The distribution of the calendar launched the Clive’s 50th Birthday Celebrations. The calendar was initially available at the December 8, 2005 Clive Historical Society and Clive Chamber of Commerce’s Holiday Open House. 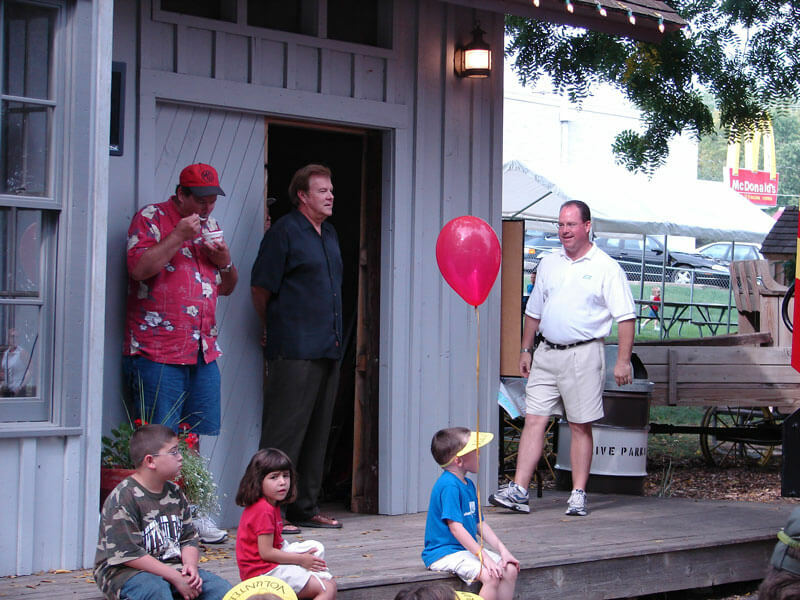 This Clive’s 50th Birthday Official Kickoff Open House was held at the Swanson General Store and Clive Depot. Paul Bissinger was responsible for our extensive marketing efforts including coordinating Clive Five-O advertisements with the CLIVE REGISTER. Paul attended all the major events where he sold many Clive Five-O commemorative sweat shirts, T-shirts, mugs, and magnets. Paul was an exceptionally dedicated salesman in marketing our 50th birthday events and activities and selling many birthday commemorative items. Dwayne Vande Krol was our committee treasurer. He kept track of our budget expenses and income including the money Paul made selling the commemorative items. On January 7, 2006 a Legislative Forum was held at Clive City Hall. State legislators from the area reported on issues for the 2006 legislative session. 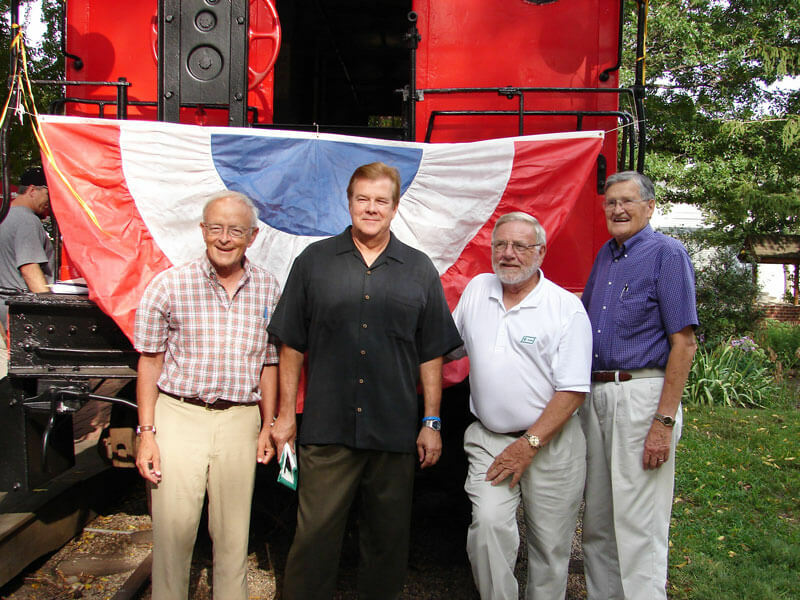 The mayor’s historical perspective on the development of Clive was presented by former Clive mayors Roy Porter, Gene Maddox, Robert Brownell and current Mayor Les Aasheim. On February 16, 2006 the Clive Public Library held their Open House from 9 a.m. to 9 p.m. There were fun family activities, kid’s activities, a scavenger hunt, and scrapbooks of library history and memorabilia on display. A “Memories of Clive” video was shown all day. The library received special recognition from the Mayor and Clive City Council for their Open House and other contributions to Clive’s 50th Birthday Celebration. The theme for April 2006 was, “Clive … Where Nature Is Our Neighbor.” April events and activities emphasized sprucing up Clive and many spring cleanup activities. Clive received a Metro Waste Award for the highest per capita recycling in the Des Moines Metro area. A Hazardous Waste Collection Day including the collection of TV and computer electronic wastes was held on April 8. Students at Crestview School collected many cans for their “Cans for Candles Collection Campaign.” Money from recycling cans collected by the students went toward the Clive Festival Birthday Fireworks. We conducted a Greenbelt Clean Up Day on April 22 which was Earth Day. On Arbor Day, April 28, eight oak trees were planted in Country Club Glenn Park honoring Mayor Les Aasheim and Clive’s seven former mayors. The Clive Parks and Recreation Department was exceptionally cooperative in carrying out our many spring events so they received special recognition from the Mayor and Clive City Council for their significant contributions. 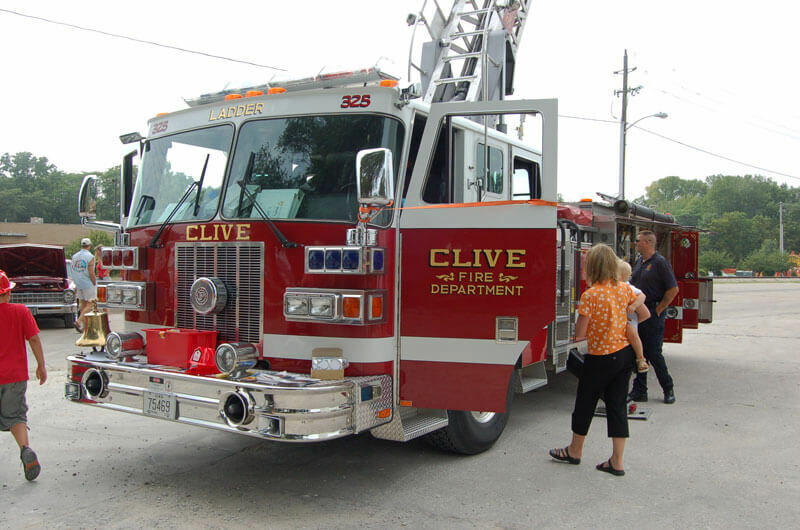 The Clive Firefighters held their 40th annual Easter Egg Hunt on April 15. The Clive Jaycees sponsored a May 5, 2006 Cinco de Mayo Celebration. This was a week before the traditional start of the Jaycees Clive After Five season. This Jaycee Cinco de Mayo Celebration event was very well attended. The Clive Festival was held from June 8 – 10. The theme was “Birthday Bash.” This celebration featured a parade with 60 beautiful floats. The honorary Clive Five-O Parade Banner Bearers were: Pam Shannon, Clive City Clerk, Jennifer Easler, Chairperson of the Clive Parks and Recreation Board, Pastor Dave Nerdig, Coordinator of Church Events, and Larry Williams, Clive Citizen at Large. Many people watched this parade even though the weather was unseasonably cold, cloudy, very windy and rainy. Linda Shanks chaired the Clive Festival Committee. She maintained our Clive 50th Birthday Web Site as part of the Clive Historical Society (CHS) Website. Linda helped with the Swanson House Historical Programs at the August 26 Big Clive Birthday Party, and the CHS December Open Houses. Linda received special recognition from the Mayor and Clive City Council for her many extraordinary contributions to Clive’s 50th birthday celebration events and activities. Clive’s 50th Birthday 5 K Bike Ride was held on June 10 in conjunction with the Clive Festival. Mayor Les Aasheim planned and organized this bike ride. He handled the many details and made all of the arrangements for this event. Mayor Aasheim lead 100 cyclists on this bike ride. The theme for July was “Cool Summer Fun in Clive!” The Clive Aquatic Center was featured. On July 16, 2006 the Des Moines Metro Arts Jazz in July Concert was held at the Clive Aquatic Center. 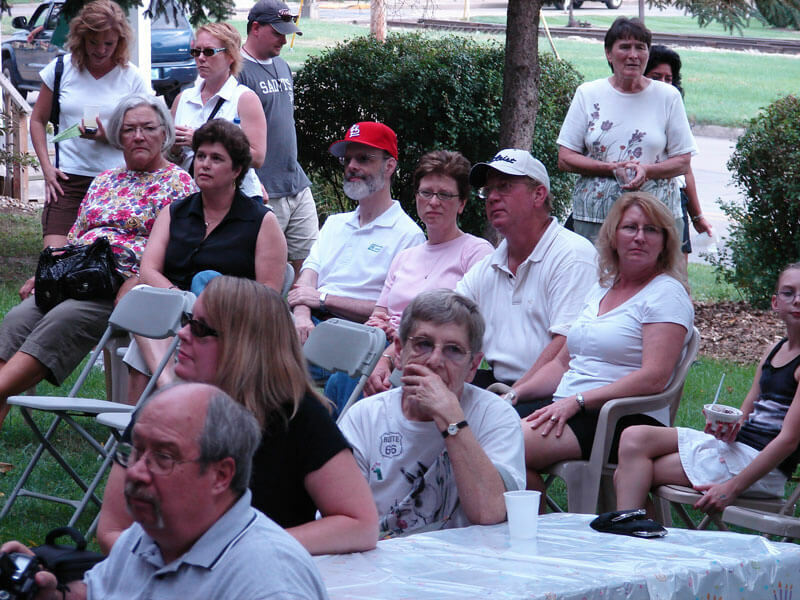 More than 100 people came out on a very hot, humid evening to enjoy the “Clive Jives” Concert. 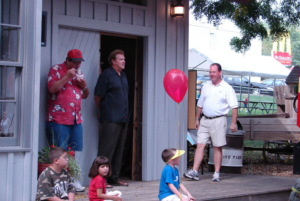 The theme for our August 26, 2006 Big Birthday Party Celebration was “Live in Clive” since we featured live music, live games and many live activities. There was something for everyone at this big party with many family, adult and children activities including old-time games and self defense workshops. April Blake organized and supervised the children games. Many other individual volunteers and Clive organizations contributed to this big birthday party. Julie Cirksena coordinated the volunteers. This big birthday party was held West of 86th Street and Swanson Blvd. in the “Heart of Clive where it all began!” Jennifer Gracey, President of the Clive Jaycees, petitioned the Clive City Council to close part of Swanson Blvd. near Reams Noodles and Swanson Memorial Park for this “Grand One Time Clive Birthday Block Party.” The council approved this Clive Jaycee petition so the Jaycees could sponsor their Classic Car Show. Bud Chiles, Plant Manager of Reams Noodles, was very cooperative in accommodating our many requests for the August 26 big party. Pam Shannon, Clive City Clerk, notified the city’s insurance company about activities included in this big August 26 birthday party so the city’s insurance policy would cover this event. Pam handled payment of the Clive 50th Birthday Planning Committee’s bills. Jennifer Gracey and Karen Leibold designed and laid out a very attractive eye catching “Live in Clive” promotional flyer. This flyer was distributed to many Clive businesses to display in their store fronts and bulletin boards. This was a very important part of our marketing advertising campaign to encouraged people to attend the August 26 party. 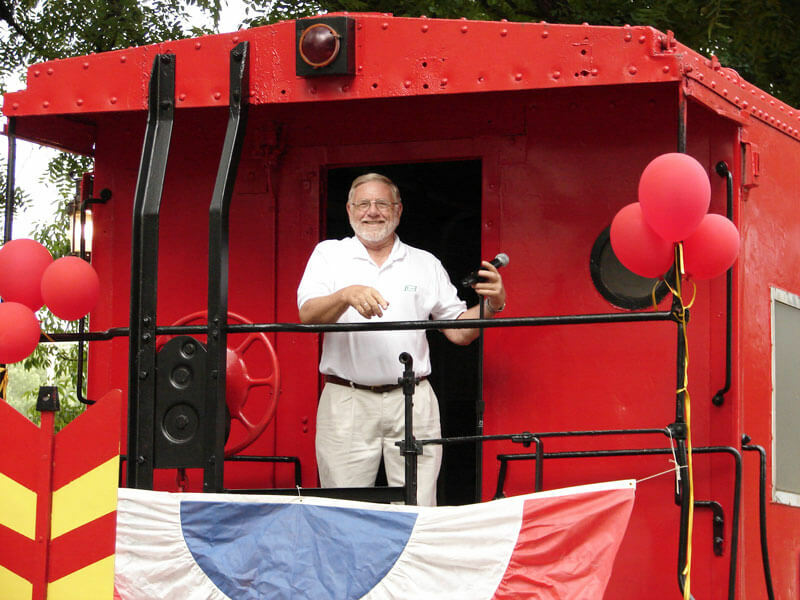 During the August 26 party, Mayor Les Aasheim’s Recognitions were made to former Clive mayors and to many others who contributed to the success of this celebration. Miss Kitty’s provided food and drinks and sponsored their first annual tent party with music by The Final Mix. Pastor Dave Nerdig from Faith Lutheran Church made fresh pop corn, and also coordinated the Clive Churches Christian Jazz and Pops Music Program. Karen Leibold and I edited “The Mayor’s 50 Clive Trivia for the 50th Birthday of the City of Clive” brochure which includes trivia on: How Clive received its name; Clive in the 50’s … 60’s; Clive Community History; and Development of the City of Clive. This brochure was first distributed at the August 26 big birthday party and was made available at all subsequent Clive Five-O events and activities. The Clive Historical Society (CHS) prepared a historical presentation for two schools and other groups. Linda Shanks helped with the CHS power point presentation and ran the projector for the fall presentations. Jim Daniel narrated the presentations, Marilyn Daniel videotaped the presentations, and Karen Leibold developed two short skits. Celebrating 50 Years – 2006!